#223 70's Yale Bowl Football Stadium! Here is a neat old Chrome postcard view! It's a super 1970's football postcard image of the Yale Bowl! It pictures an 70's era view of the New Haven CT stadium and the Yale Bowl game. Easily seen is the college football field and crowd. A neat old Conn. image! Back of card is divided and is postally unused. Condition is good, with light stain on back only. Any lines or waves are from the scanner and not on the actual image. #243 Unusual Skiing Postcard View! This is a neat one! Its a Real Photo type artist drawn card showing a woman on the ski lift above, and a man walking with his skis below. 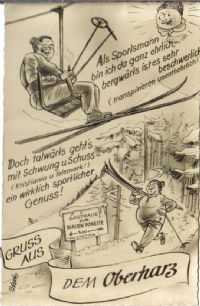 The card appears to be written in German and the front translates to: "Greetings From The Oberharz". Back is postmarked and card is in very good condition as shown. A neat ski related image! #277 Early 1910 era Baseball Postcard ! Here is neat old baseball postcard view! Judging from the uniform, it dates to around 1910 or so. It pictures a slugger in uniform with cap taking a big swing. At right a man sits with a woman on a park bench. The front reads "Just a fan in the warm summertime". Back is divided and postally unused. Back is handwritten and is printed "Berbman Quality". Condition is good with upper right corner crease as shown. Don't miss out! This is a super group of golfing postcards! 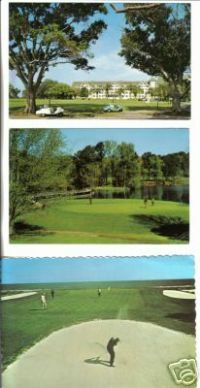 Each pictures a 60's through 1980's postcard view of the sport of golf. From top to bottom: Belleview Biltmore Course Clearwater Florida, Callaway Gardens Pine Mtn Georgia (1975), Sea Pines Plantation Course Hilton Head Island SC (1981). A nice addition to any golf / golfing sports collection! Back of each postcard is divided and two are postally used. Condition is good on all except small corner crease on second card. Any other lines or waves are from the scanner and not on the actual image. #580 RP Skiing At Stowe Vermont ! #963 Rare 1906 NJ Princeton Tigers Postcard! Here is a super New Jersey sports collectible! It is a vintage postcard from 1906. It features a colorful orange and black image of a tiger and a football. The front reads "Greetings From Princeton". Someone has handwritten "Over to see the Yale-Princeton game. 0-0, swell game". Back of postcard is divided and postmarked "Princeton NJ 1906" and "East Greenwich R.I. Nv. 18 1906". Condition-Good with a light horizointal crease at top above lions head. Still displays great!